Drum Corps International kicked off the 2007 drum corps season in high style tonight at the Navy-Marine Corps Memorial Stadium in Annapolis, Md. 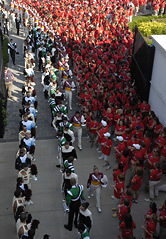 The Cavaliers, the Cadets, Glassmen, Spirit from JSU, Carolina Crown, and the Bluecoats treated thousands of excited fans to an impressive first look at their 2007 programs. The corps began the evening with a mass rendition of "The Star-Spangled Banner." 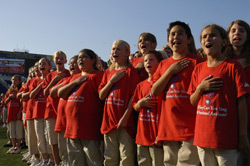 Approximately 2,000 youth performers and the "Commandant's Own" United States Marine Drum and Bugle Corps, joined the corps' massed horn lines to sing and sign the National Anthem as the grand finale to MENC: The National Association for Music Education's two-year National Anthem Project. MENC is a professional advocacy group that promotes music education. Since many of the 2,000 youth who participated in the singing of the national anthem are vocalists, tonight's event brought the drum corps activity to a whole new audience. "I thought the show was wonderful, and all the people are great performers. 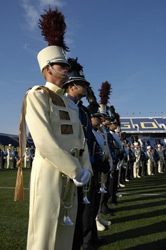 I liked the Bluecoats!" said Haley Aberson, a 12-year-old student from King School in Portland, Ore. Aberson and her classmates participated in the finale of the National Anthem Project this week, and this was their first time attending a drum corps event. A number of music industry representatives and MENC supporters were also on hand to take part in the finale. "I think this is a great event," said Laurett Arenz, Mrs. America 2002. "The work ethic that it takes to achieve something like these drum corps shows is just phenomenal." Pierre Beelendorf of MENC was impressed not only with the quality of the corps, but also the attentiveness of the National Anthem Project students throughout the event. "This gave Drum Corps International the ability to touch on an audience they don't usually see," he said. "And the kids really appreciated it, and their attention to the show the whole night was amazing. For them to get to see the quality of what's going on – it really rounded out their trip." The corps closed the evening with a special rendition of "America the Beautiful," conducted by the Carolina Crown drum majors. Drum Corps International and MENC hope to make tonight's festivities an annual event.